People offer silent prayers for victims of the March 11 earthquake and tsumani during a rally denouncing nuclear power plants in Koriyama, Fukushima Prefecture, on March 11. Radiation affecting residents in Japan's Fukushima prefecture since the nuclear plant disaster is below the reference level for public exposure in all but two areas, the World Health Organization said Wednesday. 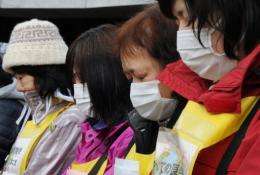 Radiation affecting residents in Japan's Fukushima prefecture since the nuclear plant disaster is below the reference level for public exposure in all but two areas, the World Health Organization said Wednesday. The town of Namie and Itate village 20-30 kilometres (12-18 miles) away were the most affected, where radiation doses reached 10-50 millisieverts (mSv) compared to 1-10 mSv elsewhere in the prefecture and 0.1-10 in neighbouring areas, the WHO said in a new report. According to the study, 50 mSv is the single-year limit for occupational exposure of workers. The WHO said that in the rest of the world the estimated 0.01 mSv dose received during the year following the March 11, 2011 disaster were below, and often far below, what is considered "very small". The report compiled by experts and based on data available up to September last year also said radiation doses received beyond the first year are likely to be lower than that after the 1986 Chernobyl catastrophe. Environmental data showed a greater influence of a shorter-lived radionuclide than longer-lasting ones, the report said. With Chernobyl about 30 percent of the lifetime dose was delivered during the first year and 70 percent in the first 15 years. In Fukushima prefecture the radiation was mostly received via ground deposits whereas elsewhere in Japan food ingestion was the main path. The dosage report is one of several studies that will feed a health assessment due to be published in the coming months, the WHO said. About 19,000 people died when a 9.0-magnitude earthquake off the northeastern coast of Japan triggered a tsunami, followed by a meltdown at the Fukushima plant.